Like many of us, most days I work at home. One of the things that breaks up my workday is lunch. For years my local Subway (the sandwich joint) has been one of my lunch options, but it’s been quite a while since I’d been there. At least several months. I knew that one of these days I’d be back, because I’m a big fan of the Veggie Delite sandwich. Turns out they’ve updated their logo. This apparently happened last summer, making it nearly a year that I haven’t noticed it, but it also might not have rolled out to my local area Subway store until more recently. Can’t say for sure. Either way, I am digging the new look. 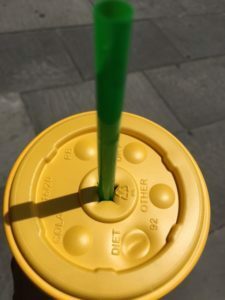 the very bright yellow lid (possibly in one size only, at least at my local branch), which I naturally gravitated toward after filling up my soda. Little by little, I realized that the messaging in the store had changed, and walking home, I noticed that the whole look went nicely with the shell of the walk/don’t walk signs at the street corner: The little perks of a lunchtime jaunt. It’s been 15 years since Subway gave themselves a makeover. This refreshing look is meant to brighten their brand and help with some of their losses and damage control they’ve managed over the past several years. And to any Subway haters out there, there are plenty of healthy options for the whole family.